Shopping for Metal Gear Solid Model Kits? The ultimate model kit for Metal Gear Solid fanatics! 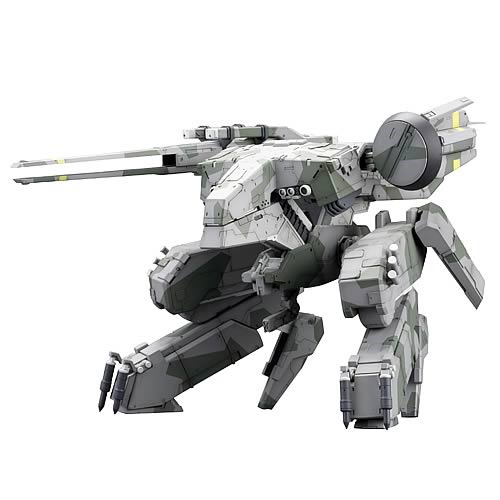 The Metal Gear REX tank stands 9-inches tall. Features armored legs, a huge railgun, Gatling guns, missiles, and laser. Comprised of 600 pre-colored pieces. The ultimate model kit for Metal Gear Solid video game fanatics and experienced model builders, this Metal Gear Solid Metal Gear REX Model Kit measures 9-inches tall at 1:100 scale when fully assembled. Designed by Yoji Shinkawa, the tank stands on massively armored legs, wielding a huge railgun, Gatling guns, missiles, and laser. Its aerodynamic main body has a forward-pointing cockpit. The REX Model Kit is comprised of 600 pre-colored pieces and is recommended for experienced model builders. Glue is required but not included. Ages 15 and up.